Because my latest Deputy Tempe Crabtree mystery, Not as it Seems, is available in all the usual places, in paper and as ebooks, of course I’ve been busy with promotion. 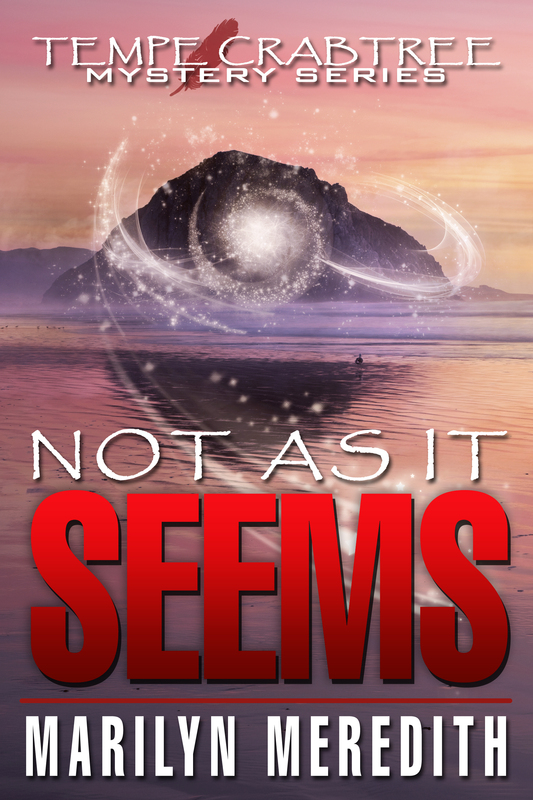 I’m nearing the end of a blog tour with today’s post being on Paty Jager, my follow Lady of Mystery’s personal blog, http://patyjager.blogspot.com/ and I’ve already participated in one big book fair over in the area where the new mystery is set, the central coast of California. I’m headed to another, The Great Valley Bookfest in Manteca CA on October 10th, and I’ll be in my publisher’s booth at the Art Festival in Visalia on October 17th. You never know how these things will go as far as book selling is concerned, but it’s a great way to meet a lot of book lovers. To be perfectly honest, I’m never really done with promotion because I have two series, which mean I have two new books coming out each year. Nor am I ever done writing–when I’ve sent one book off to a publisher, I’m busily working on one for the other publisher. Is it all worth it? To be honest, if I’m talking about money, no. You might wonder why I don’t quit. The reason is I love the characters in both series, the only way to know what’s going to happen to them next is to write the next book(s). So, is it fun what I’m doing? Yes, for me it is. I love writing and the worlds I’ve created. I love talking to other writers and readers. What I’m wondering is, is it fun for the rest of you writers? And readers, do you enjoy meeting writers at book fairs and other places? I have no clue how to go back and fix a typo in Word Press, so it should be my publisher’s booth, not book. In any case, I am and will be busy for awhile. I love it, too, Marilyn! Writing for publication doesn’t bring a lot of money but it does bring other rewards. I love to talk to readers and to other writers and I love the challenge of always improving my writing. I love it, too, Marilyn! The rewards I get from my writing are being able to meet and talk with readers and other writers. I also love the challenge of constantly striving for improvement. It’s the most fun job of any I’ve ever had! Hi, Amy, I feel exactly the same as you! HI Marilyn, I was on the road yesterday. I do enjoy writing the books! Especially, my Shandra Higheagle mysteries. The characters, the setting, and the who dunit is what keeps me writing the mystery and hoping readers enjoy them as much. Thanks for guesting on my blog! I too hope my readers enjoy my books as much as I did writing them.